Due to its high dependency on international trade, South Korea is highly susceptible to global protectionism and a hard landing of the Chinese economy. Geopolitical tensions on the Korean Peninsula have decreased somewhat after several meetings between South Korea´s President Moon Jae-in and the North Korea´s leader Kim Jong Un last year and Kim Jong Un´s historical meeting with US-President Trump in June 2018. However, tensions over North Korea´s nuclear and missile program flaring up again cannot be ruled out. 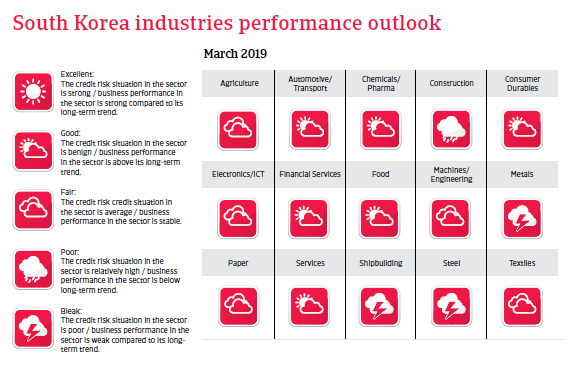 This or even an escalation of the conflict on the Korean Peninsula would have adverse effects on business and household confidence in South Korea and on foreign investors. 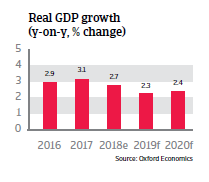 After a year-on-year decrease in 2018, GDP expansion is expected to slow down again in 2019; mainly due to lower export growth. The domestic economy is impacted by a slowdown in construction activity as tighter mortgage lending rules have been imposed in order to contain the high indebtedness of Korean households (with debt levels at about 160% of disposable income). 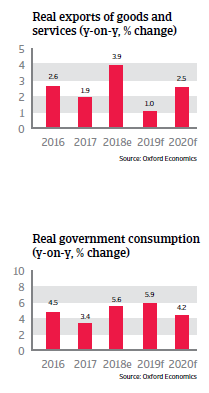 That said, fiscal support (increase in public employment, more social spending and another minimum wage increase) is expected to sustain economic expansion. The agreement on a revision of the US-South Korea Free Trade Agreement in September 2018 has alleviated fears about the South Korean economy´s exposure to US punitive import tariffs. However, due to its high dependency on international trade and integration in the Asian supply chain South Korea is susceptible to risks stemming from an escalation of the Sino-US trade dispute and a hard landing of the Chinese economy. Exports account for about 50% of the country’s GDP, mainly semiconductors and other electronic goods, cars and chemical products. A low public debt level (43% of GDP in 2018), low external debt (28% of GDP in 2018) and consistent current account surpluses provide the South Korean government with flexibility in supporting the economy and offer some protection against international trade and investment volatility. It seems that South Korea’s current economic model - export driven and dominated by chaebols (the South Korean form of business conglomerate) - is no longer capable of providing sufficient employment and purchasing power growth. The outcome of government efforts to reform the conglomerates still remains to be seen. More reforms are needed to diversify the economy, away from an overly export-orientation towards growth driven by services and domestic consumption. The government has started measures to improve innovation and productivity of smaller businesses. The high level of private debt remains a downside risk for the economy, together with a rapidly ageing population. Competition from China – by far the most important export market - is getting fiercer, as Chinese businesses are successfully climbing up the value chain in some of South Korea´s core export industries like automotive and electronics.